COMPANY PROFILE Bank of America Corporation is a bank holding and a financial holding company. The company provides financial products and services to people, companies and institutional investors. Bank of America is one of the largest financial institutions in the United States and the world, with lending operations in the consumer, small-business, and corporate markets in addition to asset management and investment banking divisions. 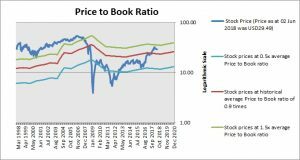 At the price of USD29.49 as at 02 Jun 2018, Bank Of America Corporation is trading at a Price to Book Ratio of 1.2 times current book value. 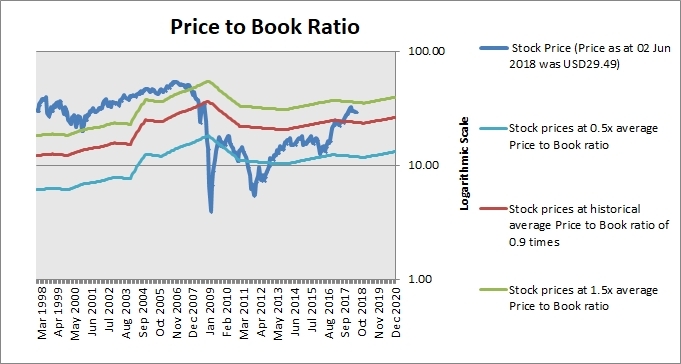 This is a 24% premium to its historical average Price to Book Ratio of 0.9 times.